Want a big, fat Greek bowlful of pasta, but not the carb coma that inevitably follows? Replace those starchy strands with spaghetti squash and instantly boost your vegetable intake with ease. Serve it right out of the squash shells for a fun bowl-in-one presentation that even the kids will love. This vegetarian and vegan dish is also packed with protein because of the addition of extra-firm tofu. Of course, it is also gluten-free! Pasta night was never this colorful and delicious! Having trouble cutting that spaghetti squash in half? Using a sharp knife, poke a few small slits in the squash skin. As if you are poking a dotted line along where you plan to slice the squash in half. Then place the squash on cutting board with the most-flat surface down and slice along your ‘dotted line’ of slices. Per Serving: 403 calories; 20g fat; 52.1g carbohydrates; 15g protein; 0mg cholesterol; 433mg sodium. 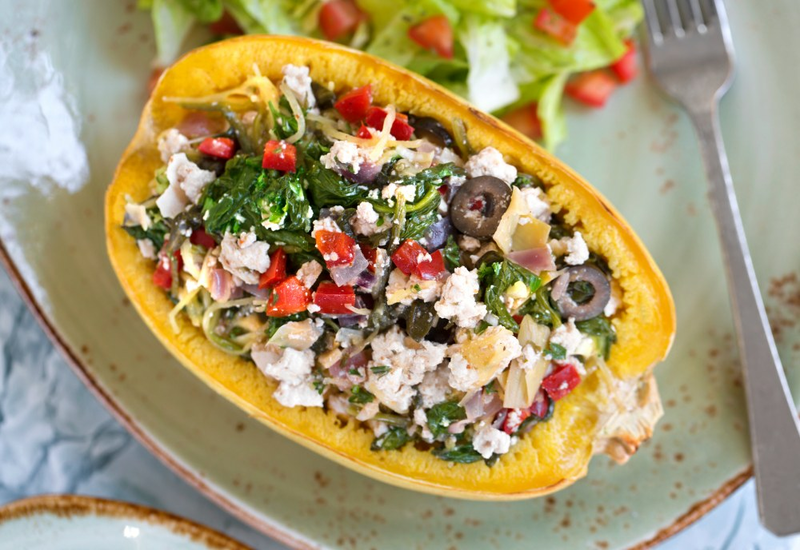 Greek and spaghetti squash are two of my favorite things, so it only makes sense that it would taste great together as one. I was expecting it to be good, but it surpassed that, it was fantastic. Definitely going to make this again. I love Greek salad and this dish reminded me very much of that, but in a spaghetti squash bowl. Overall it was very delicious and filling. I'm not a vegetarian so I added grilled chicken with it, but the recipe is good with or without meat. This was so pretty! It would be beautiful served up next to a grilled chicken breast if you're wanting meat with it. Of course I tweaked it..I tweak everything! I omitted the tofu and added Feta Cheese. I didn't have a jar of artichokes so I used Artichoke Pesto ~ yum! And used kalamata olives to keep it Greek. Looking forward to making this again! !